I wish politics was less contradictory because both hold true. I think Correa would have won, but I also think that it was very easy to set up an anti-Correa platform. You got two broad sections of society — one that would have voted for Correa and one that wouldn’t have voted for Correa. I think Moreno managed to get elected with one half, but rule with the other. I would say that the Left within the government is now almost nonexistent. Those sectors that we were describing that joined Moreno’s government, little by little soon realized that Moreno had a fundamentally neoliberal agenda. We’re seeing now all these laws coming into force that are basically bringing a new kind of structural adjustment with moves away from the model of development that Correa and his government implemented. All the key ministries are now in the hands of not just the Right, but hardliners including the key advisers of Moreno’s opponent in the 2017 election. The new minister of finance was the financial adviser to Moreno’s opponent. So the Left that’s in government in Ecuador is in marginal places. We just had another resignation last week. It’s got its hands tied. There were some doubts during the first few months, including internationally as to whether Moreno could still be considered left. 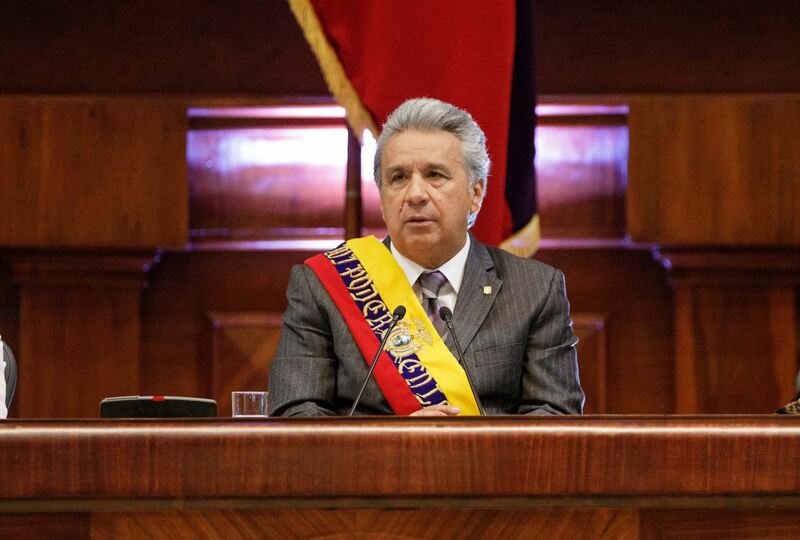 But I think consensus everywhere now, including outside of Ecuador, is that Moreno has not got a left-wing government in place and that in every possible way, economically, geopolitically, it terms of his foreign policy, it’s a conservative turn. So where is the Left at? In opposition. There are few small parties that are accompanying Moreno, but all the others are now in opposition. What is amazing is Alianza PAIS itself. It was founded by Correa then expropriated by Moreno and all of the key founding people were thrown out. Now, it’s an empty shell. PAIS was for years the biggest party in Ecuador, and yet it basically has crumbled because the party is divided both in its parliamentary expression, between those who remain loyal to Correa and those who sold out to Moreno, but also in its grassroots expression. In the grassroots, where there are less interests, less salaries involved, less power and less money to be thrown around, obviously a huge majority of PAIS supporters have remained loyal to Correa. This means that they are now partyless because Moreno’s government and all the institutions that he controls have prevented Correa from creating a new party. Moreno got control over the PAIS but the party is now insignificant. It’s lost its majority in Congress, not through votes, but through all these lawmakers leaving the party. And so Moreno has lost his majority and by losing his majority has also had to cuddle up to the Right because the only way he’s been able to govern is with this hotchpotch alliance that’s pressuring him to do neoliberal structural adjustment. So the Left is in opposition, obviously divided in a myriad of different expressions, but it is increasingly united against the neoliberal turn. There are diehard Correistas, there are Correistas that are critical. Some people that were very favorable to his socio-economic policies and his foreign policy, the kind of birth a sovereign nation state, were critical of other things, for example the issue of abortion. There’s all sorts of different types of Correismo, and there is also the Left that’s not Correista. It’s more marginal, it’s smaller, but it exists and we are now seeing people who are on the left-wing opposition to Correa, including people who were aggressively anti-Correa who are now aggressively anti-Moreno. So we are seeing the Left reconfiguring itself. You mention an anti-Correa left that is shifting against Moreno. Who are you referring to? The anti-Correa left was always small and elite. The only non-elite aspect was the fast-declining indigenous movement CONAIE which, since unfortunately co-governing with Lucio Gutierrez between 2003-5, has been going downhill. There is still some indigenous remnants there, but it’s never really been important electorally. Then there is another kind of hard-left that calls itself Maoist, although I don’t think it’s got any Maoist element to it. They are linked with trade unions and the clientelistic relationship with the state. They were called the Democratic Popular Movement and are now Popular Unity. They were always very opposed to Correa because he obviously cleaned up the state’s relationship unions. They are not against Moreno because he has given them a lot of space in the states so as to not have problems. Other sectors of the Left, particularly the liberal left, certain elites, are starting to become more critical. You’re seeing left-wing academics, economists for example who thought that Correa wasn’t radical enough, always carrying a left-wing critique of Correa, being even more critical of Moreno. Do you see Lenin’s “betrayal” as something that developed, a product of a process of divergence, or do you think there was something more nefarious involved? Nobody was expecting Moreno to be identical to Correa, nor should we have expected him to obey Correa or be Correa’s puppet. Anybody who was going to be legitimately elected should have their own program of government and we all expected that. In many ways, we wanted that. But it’s one thing to say “I’m going to be my own man, I’m not going to be a puppet,” it’s different to implement policies that are exactly contrary to what he offered people in his political campaign. Moreno is implementing the program and promises of his opponent in that political campaign. He actually said on camera half-jokingly that he “was sort of hating” the people who voted for him. That is contrary to the idea behind representative democracy which is that you have a program, you make promises and then if you’re elected, you enact this program. And if you don’t what you are actually saying is that you’re lying, you lied throughout the campaign, your program was a lie, your promises were a lie. You can’t say, as Moreno has, “I’m in favor of the Citizen’s Revolution, what we’ve done is really important terms of our sovereignty, in terms of our social justice and redistribution” and then warm to the United States, want to expel Julian Assange from the embassy, join the Pacific Alliance, put an end to the peace process between the National Liberation Army (ELN) and the Colombian government in Ecuador, and implement an aggressive neoliberal structural adjustment program. This is not about just personal rivalry between two leaders. This is something integral, which has geopolitical consequences. It’s something which has been encouraged and celebrated by Ecuador’s elites, Latin America’s elites, and US elites. I think the United States is happy with it, you see that from the US ambassador in every photograph, in every ministerial event that’s organized in Ecuador. He appears with a booming smile. It’s very clear, I think, what’s happening geopolitically. The extent to which it was premeditated or whether it unfolded is something we have to analyze beyond political rhetoric. Historians will have to examine with a lot of rigor whether there was a plan from the start, including international involvement, or whether the United States jumped on the bandwagon and gave further incentives. But I’m absolutely certain that this is not an innocent occurrence — it’s part of a broader project that seeks not just to put an end to Latin American’s left governments, but actually to throw dirt on their legacy. In that sense, the Moreno government inserts itself into TINA — “there is no alternative” — into the kind of neoliberal fatalism that you cannot have anti-austerity success, or successful left-wing governments in Latin America. This is what is really at stake. The dirt that’s being thrown at Correa is about trying to change the judgment of history, but I don’t think they are going to succeed. I think there are too many of us that are going to be fighting back. The people have more memory. Regionally things have also changed a lot in the last few years. Not just in terms of election results, but also lingering questions around addressing the contradictions that arose from the Left coming into power. Aside from your role as foreign minister, you led various regional political initiatives for PAIS. What lessons should the Left on the continent draw from these experiences in government? We should learn from our mistakes, clearly. Correa’s project was to create a modern nation state, in a very pre-modern context. Ecuador is in many regards one of the most premodern states in South America. Correa created a much more stable, modern nation state with redistribution. Ecuador has a lot to teach Latin America and the Left, it was successful, it was economically viable — which is always the critique that’s thrown at the Left. The economic model was interesting in terms of its redistribution, the reduction of inequality in the most unequal part of the world. It was successful also in terms of its international projects: sovereignty, integration, inserting yourself strategically in a multipolar world. So these are the successes, but there are things that it was less successful at. I think it’s difficult to have a left project today if you don’t have a more radical stance on feminism, particularly in the Latin American context. This is also the case because the global north tries to make an ethical pedestal out of the fact that the global south is still premodern in a number of aspects. Now of course we know that these issues have tended to advance with modernity, urbanization, and literacy, these aren’t separate. And in Ecuador, there were some aspects where we had success, for example women’s representation in politics. We had a parliament that had way more women as legislative representatives than most European democracies. But I think the revolution should be not just social, not just economic, it should also be feminist and it’s something that we need to do. Environmental simplification is also tool of imperialism. A lot of the environmental problems that Latin American countries such as Ecuador face are because of the lack of modernity in the first place. So if you don’t have organized cities in the Amazon with good sewer system and if all the waste goes into rivers, which is a consequence of weak states, a consequence of neoliberalism, a consequence of premodernity, then you’re going to damage the environment more than if you have what are often condemned as developmentalist policies. There is a myth that we have been a victim of, but it’s also true that we could have done more to make sure that our development was environmentally friendly. We could have done more also to mobilize politically around the issue of the environment and to create the right kind of political alliances in order to create hegemonic consensus around the rights of nature, which we actually enshrined in our constitution. So on gender, reproductive rights, LGBT rights and the environment, which is the big issue in twenty-first century, we should have done more. Generally in Correa’s government there was a lot of concern for the global commons, public goods, all these things that had to be dealt with at an international level and not just superficially by NGO-style “nature is beautiful” discourse without really thinking in structural and systemic terms. There are two types of redistribution. The first is the kind of national redistribution where you redistribute to the poorest people, and that’s the big problem in Latin America because of our inequalities. But there is the other the type of redistribution, between rich and poor countries and that you cannot do by decree or public policy. You have to do it through changing the unproductive matrix and your role in the international division of labor. That’s the only way because there’s no global government that’s going to redistribute. That is where Correa was strong, and where Ecuador was strong. Ten years is not enough to change your productive matrix, but the vision was always in education, in higher education, in science and technology, in energy, in developing new sectors. Not just to use the money we had from oil or from other sectors to redistribute, but to invest a significant amount in transforming the economy for global redistribution. That’s something I think Ecuador can bring to the Latin American left because it talks a lot about domestic redistribution but very little about international redistribution. We need to unite the Left and iron out differences. It’s always easier to iron out the differences from opposition than it is to do it from government, because when you are ruling, you do things that divide people. But when you’re in opposition, it’s much easier to find what Laclau used to call the empty signifiers that make for a broad, anti-oligarchic platform. And I think the next time we’re are in government, we should try and strive for less divisions than we had this time, and to try maintain that platform.